“I’m so glad I went with my intuition to work with Curious Design in developing the website… As style and creativity is such a fundamental feature of the blog it was important for the aesthetics of the site to be beautiful while remaining user friendly. I wanted a website that would stand out from the crowd and I couldn’t be more delighted with the results. Curious met my requirements and totally exceeded my expectations anticipating and responding to my needs from start to finish. They were a pleasure to work with, providing valuable experience from a graphic design perspective as well as their knowledge and experience in building and constructing the site. 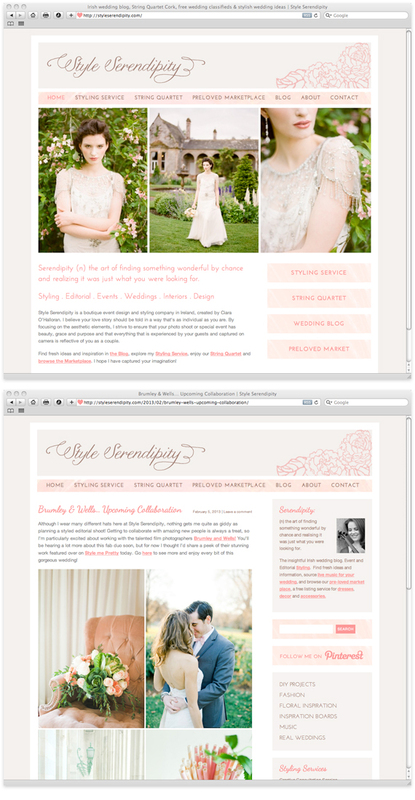 Style Serendipity is an Irish wedding and styling website created by stylist, blogger and musician Ciara O’Halloran. We worked with Ciara to create a beautiful and elegant site to reflect her own personal style, and to complement the weddings and inspiration that she will be featuring on the blog. Built in WordPress the blog is easy to update and add posts to. We also built a classifieds section so that users can buy and sell pre-loved wedding accessories, dresses and decor.